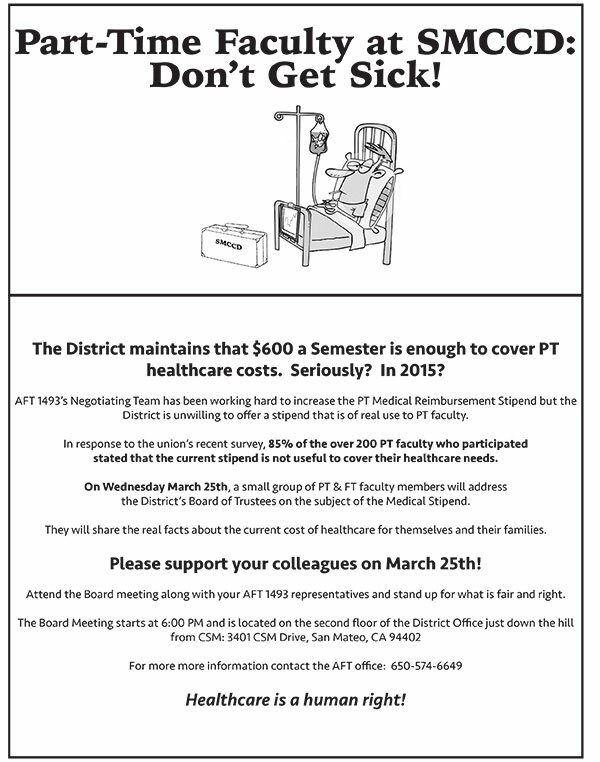 AFT1493 | Part-Time Faculty: Don’t Get Sick! Part-Time Faculty: Don’t Get Sick! The AFT Negotiating Team researched the amount of coverage provided to part-time faculty in the Bay 10 community colleges, and only one other college (which offers NO benefits whatsoever for part-timers) fell below our district. In fact, of the ten districts, seven offer part-timers coverage through Kaiser or another health plan. Only one district aside from ours provides a stipend and the other district’s stipend is $400 more per semester than ours. For a more detailed comparison of benefit contributions by district, click here to see the chart. The union’s recent survey of part time faculty uncovered serious inequities in healthcare coverage for part-timers. 30% of the part time faculty who responded to the survey pay for an individual health insurance policy (i.e., they are not covered by any employer, their spouse or Medicare), and 8% are either uninsured or under-insured. The average monthly payment of out-of-pocket health expenses by part timers who answered the survey was $459.98. That’s $5,519.76 per year! Even among faculty with the most modest out-of-pocket payments, the district’s stipend only covers one-half of their annual premiums, not including co-pays and other fees. If you missed it in the February issue of The Advocate, you can read the full report on our survey here. On March 25 at 6:00pm, a group of five faculty members, both part-time and full-time, will be making a presentation to the District Board of Trustees on this issue. Your colleagues will share a combination of evidence-based arguments and real-life testimonials in an attempt to persuade the Board to support an increase in the medical benefits stipend — from $600 to $1600 per semester. We need your support to make a strong showing. The more faculty members who show up for this agenda item, the more powerful the statement. If you are able to attend, please RSVP to kaplan@aft1493.org by Monday, March 23rd. If you have any questions feel free to reply to this email. Join your colleagues to show the district that this issue matters to all of us. Thank you for your time and your action!